Uses: In Africa Cocoa Butter has been used for centuries as an emollient that is soothing, smoothing and keeps skin supple. It helps to moisturize and heal skin that is suffering from exposure to the elements. Cocoa Butter is now used all over the world and in a variety of foods and cosmetic products. In cosmetics it is most commonly added to shampoos, cleansers, body washes, soaps and being a natural emollient with a smooth texture it is ideal for creams, lotions, facial oils, and lip balms. Cocoa Butter can be used to help prevent stretch marks, diminish or reduce the appearance of scars (although this is unproven), as a daily moisturizer for itchy, dry skin and can treat and relieve chapped lips and skin. If used on a regular basis it is able to promote the elasticity of the skin and the healing of chapped skin. Although it is a solid at room temperature, Cocoa Butter melts upon skin contact and therefore makes an excellent balm or salve for lips or skin. Cocoa Butter is often used by people in order to expedite a suntan but this is a practice that is unsafe as Cocoa Butter does not have any sun protection factors (SPF). It will enhance a natural tan though. If one does want a suntan, despite the sun harming aspects of having one, use a suntan lotion with Cocoa Butter and an SPF of at least 15. Our Cocoa Butter is somewhat firmer at room temperature than our Shea Butter. In order to soften the Cocoa Butter you can melt with heat. We recommend adding some of your favorite carrier oil to the butter. You can easily make a "Belly Balm" for those who may be mothers to be by adding as well a couple of drops of Neroli and mandarin. It can also be used in other recipes to thicken or add body to any salve, balm or cream. Cocoa Butter is also used to make chocolate. Cocoa Butter is the natural fat of the cacao bean which is extracted in the process of making cocoa powder or chocolate. It is a solid at room temperature but has a melting point of about 34 to 38 Celsius (93 to 100 degrees Fahrenheit). This causes chocolate to be able to melt once inside the mouth. It is able to change states rather easily as its melting point is just beneath body temperature and is able to therefore change from a solid to a liquid rather quickly because of its steep melting point. 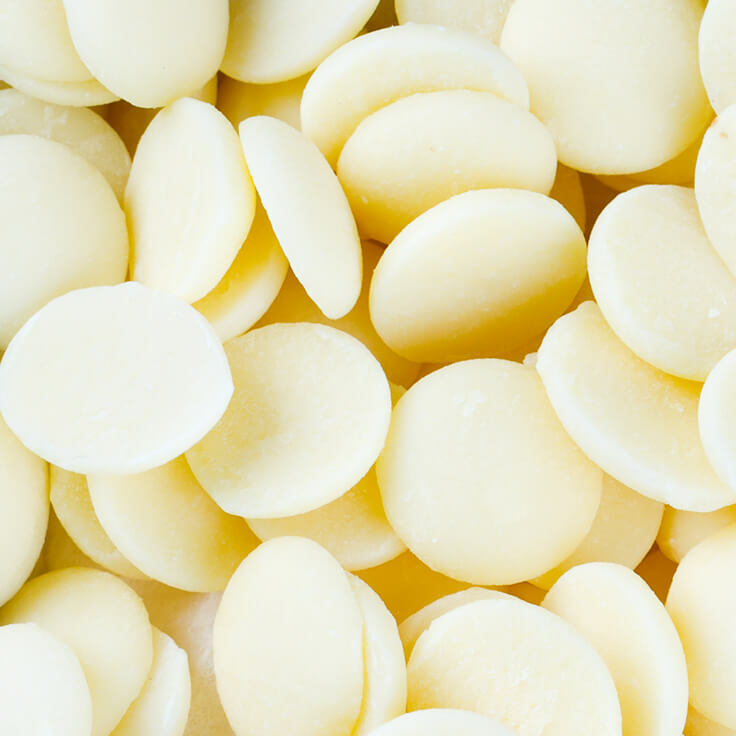 Odor: Our pure cocoa butter is deodorized which removes the chocolate aroma. It has also been decolorized to make it yellowish. Natural: Cocoa Butter is a natural, fat that is extracted from the seed kernels of the fruit of the Cacao tree (Theobroma Cacao). The trees which produce the fruits and seeds which our butter is obtained from grows in the mountain areas of Togo. The Cacao tree can be found in various tropical regions around the world. Cocoa Butter is also highly praised for it antioxidants and these properties are due to the tocopherols it contains as well as a certain polyphenol called CMP. CMP has been found to be able to suppress active oxygen. Active oxygen is a factor that is found to exist in cancer. CMP is also found to be helpful in relieving topical dermatitis as it inhibits the production of an immuno globulin that is found to exacerbate this type of dermatitis. Shelf Life: Cocoa Butter is a stable fat that contains natural antioxidants and these antioxidants give it a long shelf life spanning over 3 years. Storage Directions: Cocoa Butter should be stored in the refrigerator in an airtight container. Procurement: You can buy wholesale Refined Cocoa Butter by the pound at SoapGoods.com, your favorite supplier for pure Refined Cocoa Butter. This is only part of the extensive selection of wholesale aromatherapy, cosmetic, soap and craft making products available at SoapGoods.com. Be sure to check out our entire selection!